At our first meeting, a no-obligation, in depth interview (in our home if you live in or near Portland, Oregon; otherwise via scheduled phone time), we take the opportunity to learn about the two of you as well as introduce ourselves. 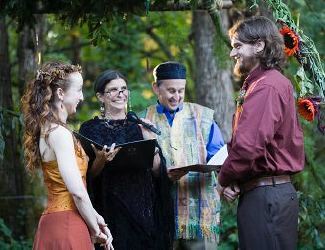 Storytelling provides a good basis for constructing ritual, and your shared stories of life events will lay the groundwork for the eventual structure of the ceremony. Exploring your spiritual and communal roots will help create the vision of an event you can share with others which will become a strong and meaningful memory for all. 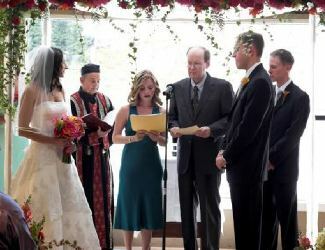 We welcome interfaith, interracial and multicultural couples as well as those of the same faith or tradition. Perhaps you met through mutual friends, or on a Jewish, Hispanic, Black or a Christian singles dating site? Let Your Personal Ceremony be the next step in your relationship, helping the two of you express more fully the love story you share. 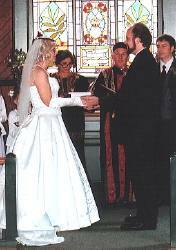 Once we have gathered information and established a working relationship, we present you with material from previous ceremonies we have performed, so you can select those sections which have meaning for you. This will provide the basis from which we will bring to your attention additional source material. We will employ our creative writing skills to weave in memorable events, like when you first met or times during your courtship. Previous clients have commented on how much more they have been able to receive and learn from these sacred occasions because of the questions we have asked, the materials we have presented to them, and the support we have supplied. 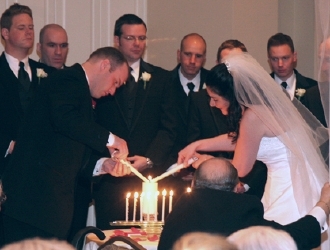 We are a wealth of information and can guide you in your wedding venue selection, musicians, photographers, where to purchase such special items as Unity Candles, Sand Ceremony paraphernalia, Mexican wedding supplies, Jewish wedding objects. The years of life experience that has lead each of you to this threshold can best be honored with words and rituals. 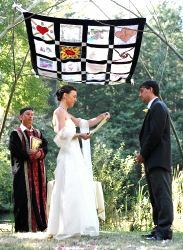 We will research your particular ceremonial tradition and suggest possibilities. 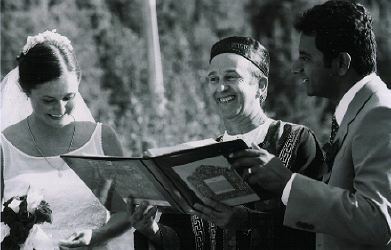 If one or both of you are Jewish, you might want to include: signing a Ketubah, a Chuppah, Circling, the Seven Wedding Blessings, Breaking the Glass,Yichud or Seclusion after the ceremony and possibly ask us to offer a group blessing after you leave the chuppah. 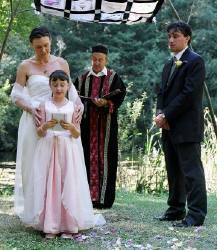 In a Jewish/Christian intermarriage, we are happy to co-officiate with a priest or minister. 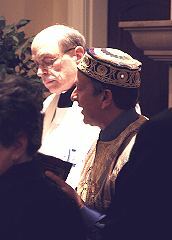 In such a case one of us is the representative of the Jewish faith and a priest or minister represents the Christian faith. Such a ceremony truly honors both families. 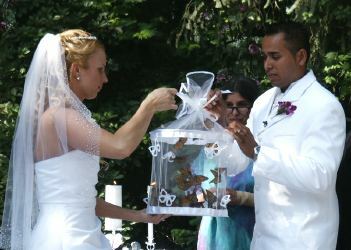 We enjoy providing a bilingual wedding if family members are present who do not understand English. We can co-officiate with a translator. 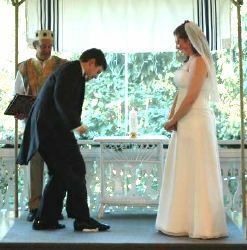 Not all ceremonies require a rehearsal - it depends on the number in your wedding party and the type of rituals. Having one can give you the sense of security that all the details have been addressed. 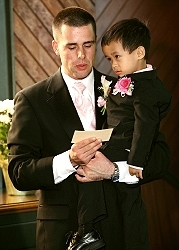 We are always available to assist or orchestrate the rehearsal and to guide the processional. 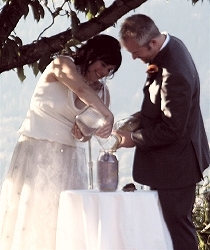 We can help you create your wedding program to hand out to guests, and locate special items for your ceremony. 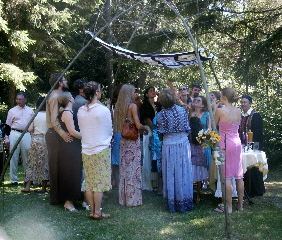 Once a framework has been established, we continue editing the ceremony via e-mail. 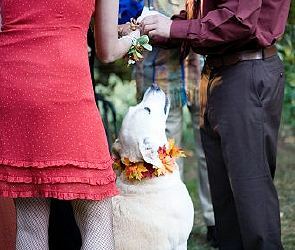 We communicate as many times as necessary to decide on final details and polish the ceremony to perfection. to a transformed level of confidence and fulfillment!